the page you see will have an area named Storage. Tap this and you should be to a page that looks like or similar to the screenshot in this post. Now tap on the Manage Space button and tap the Clear All Data button. You will get a pop-up warning that lets you know your Google Search, Feed and Google Now Launcher data will be deleted which is the objective of this exercise. Tap OK and the deed is done. 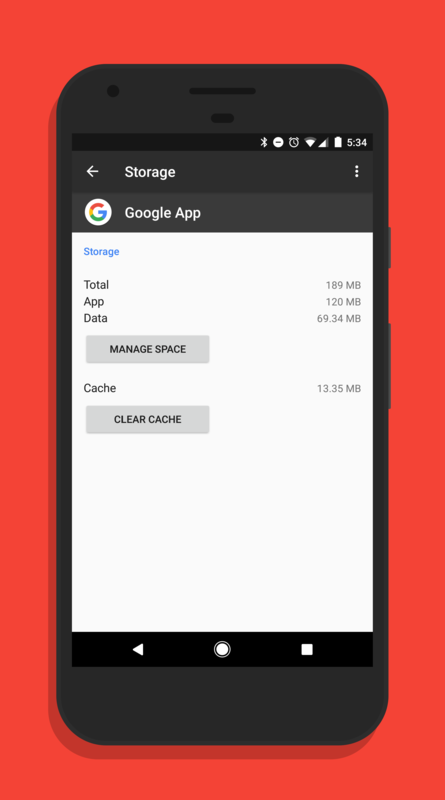 Some users have reported that instead of using the Manage Space and Clear All Data button that they have been able to achieve the same fix by tapping the Clear Cache data. I, for one, was not. I had the same “Failed to load cards” error after trying to clear the cache. You could give this a go on your phone first rather than the deleting of everything. It won’t hurt, it just may mean that you have to go through this process twice if it doesn’t work for you. Which ever method you use and works, you should now be able to go into the Google app and setup the Now cards once again. This should be a matter of a couple of taps as all of your preference will have been backed up to your Google account and be restored for you. Give these a try and see if it solves the issue for you. Do drop a line and let me know too.